After our Atlantean Adventure at The Lost Chambers, Ed and I had a gastronomic escapade around the world in Kaleidoscope. It was during my birthday, so I had a valid excuse to dive into a massive buffet with International flair! Hahah! Since it was a weekend, we settled our dinner reservation a night before and received a booking code to show at the lobby. The restaurant is located at the Ambassador Lagoon of Atlantis The Palm, an area which is only accessible to hotel guests and to visitors with dining reservations. Kaleidoscope is one of the twenty outstanding restaurants and bars at Atlantis The Palm. It is the perfect restaurant for us who wanted a casual dining experience, a lively atmosphere and a splendid buffet with live cooking stations. Ed and I arrived at Kaleidoscope for dinner on its opening hour, when most of the tables were unoccupied and the dishes at the buffet were untouched. A staff happily toured us around the buffet area before she led us to our table. I went back to the buffet, took my starter plate and the next time I looked around, the dining area was already full. Long tables were suddenly occupied by families and group of friends. Each buffet station was decorated based on the cuisine being served. We can actually guess what's in store for us just by merely looking at the stations from afar. In a table decked with Arabian lamps were mixed kebabs and assorted mezzeh. Inside the traditional Indian bronze pots were tandoori and curries. Just in front a brick oven were Italian dishes. Asian Dim Sums were in bamboo steamer baskets and all kinds of sushi were travelling in a conveyor belt! I don't usually eat heavy items whenever I have hundreds of other options, but that night, I gave in to the temptation of having a sliver of roast beef! It made me full in an instant, but I had no regrets. It was perfectly seasoned, fork-tender and traditionally served with gravy and Yorkshire Pudding. The themed-buffet sections were arranged around the dessert table which was overflowing with sweet stuff ! It was the center of attention, the star of the night! There were cakes, hot pastries, ice cream, chocolate fondue and candies; including gummy bears and lollipops for the kids. I love the fact that I can have various cuisine in one sitting, but I only got to try one-tenth of the whole buffet menu. I missed the Osso Bucco, Tandoori and Risotto. I missed a lot, actually! I think, it's impossible for anyone to try everything. The choices were endless! What's delightful is that every item that I picked from the huge selection tasted superb. Nothing was ordinary, even the simple-looking chicken bun from the Asian section! I almost forgot that I turned a year older that day until three waiters sang the birthday song and approached our table with a birthday cake! I smiled. I blushed. I grinned the whole time in the most awkward way. At 31, I still love to make birthday wishes before blowing out the cake candles, but the birthday serenade in public was quite an uncomfortable scenario. Anyhow, Kaleidoscope and Atlantis The Palm did a great job on making me feel special and young-at-heart! 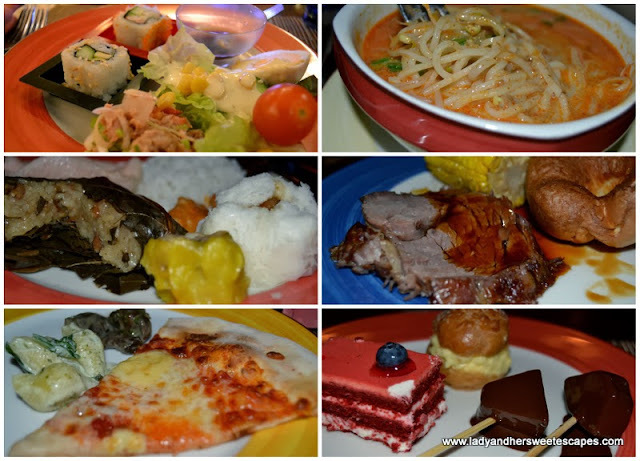 *International Dinner Buffet costs 195 AED /person (food only) as of October 2013. *If you have the Entertainer Dubai 2013 books, there's a Buy1 Get1 voucher inside Volume 1. *Please do check Atlantis The Palm's official website for current rates and promotions. Hello, Ahmad! Thank you for dropping by! Oh my! that's a lot of food.. drooling! Very pretty sis... belated happy birthday and stay blessed! Wow beautiful place, I bet you indulge yourself with those yummy goodness food. Happy Birthday! What a great idea to spend a birthday dinner at a buffet restaurant. That should be in our lists of things to do by me, my husband and my mom. Yum!